When Castle Morpeth Borough Council ceased to exist on 31 March Irene Brumwell hung up her robes and hat for the last time and looked back on her year as Mayor which was packed with interest and activity. Irene, originally from Bradford, has lived in Ponteland for more than forty years. When asked about the highlights of her year she said that meeting Prince Charles and Camilla, when they made an unscheduled visit to see the flood damage at Morpeth, was special. ‘They were so interested and warm ‘. In Ponteland she has special memories of visits to the Grange Lea care home and her welcome there, the applause for her personally when she stepped out of the Mayor’s car at the Methodist church and her enjoyment when she opened the Party in the Park among so many friends. She also visited the further reaches of the Borough to share the experience of people working for their communities with proud youngsters in marching bands or sampling a variety of sports. Irene says she loved seeing the young ones and sharing their joy and pride. Another of her delights was showing people around the Mayor’s parlour in Morpeth Town Hall which was recently refurbished. It is full of historical paintings and artefacts, some of which go back to the thirteenth century. Another role, which was more daunting, was chairing the full meeting of the Council. Now she will have more time for her five grandchildren and Ralph, her very supportive husband, and perhaps knock the garden into order. Top photograph: Irene Brumwell, Mayor of Castle Morpeth Borough Council. Below: Lucky Spot at Belsay Castle. 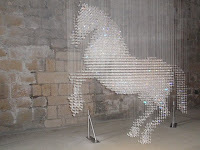 Castle Morpeth BC funded the return of Stella McCartney’s Lucky Spot, the fantastic crystal horse she designed specially for the great hall of Belsay Castle and there was a low key event with English Heritage to celebrate the installation. Irene was there to welcome everyone. Open from Easter.